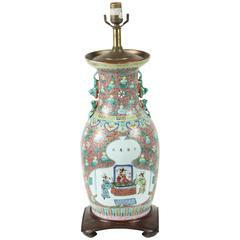 Rustic Chinese water bucket jar shape lamp with raised rib trimmed detail encircling the body. 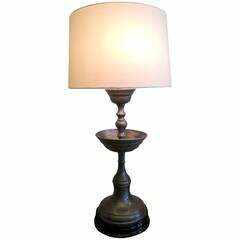 Topped with coolie style Belgium linen lamp shade. Euro type lamp socket. Shade and lamp can be sold separately. Base $1400/Shade $400. Height of lamp with shade - 24.50" Lamp shade top - 7.50" Lamp shade bottom - 23.75" Lamp shade height - 9.25" Base only measure 18 D x 18.25 H.
Asian ginger jar shape green vintage ceramic lamp with brass fittings (no harp or shade) Sits on a painted brass base and a carved wood base. Size: 23 H x 6D, 1970s, Asia. Beautiful 19th century antique black glazed Chinese water jar, mounted as lamp, with a handmade Belgium linen shade. Substantial Chinese pewter candlestick lamp. 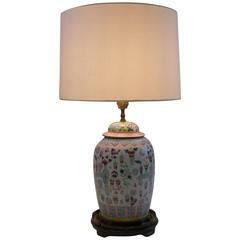 Chinese vase as a lamp in shades of pale pink, aquamarine and soft yellow. Chinese ceramic vase turned into a table lamp. Figural scene, Chinese script and nice pink and turquoise foliage designs. Wooden Chinese style base.